The Allard Sports Car Company have specially restored and built a continuation of the 1963 Monte Carlo Rally “Allardette” Anglia 105E. 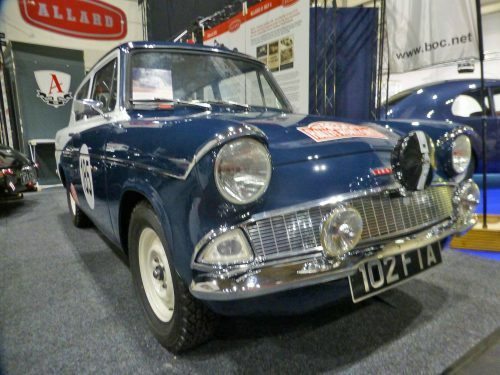 This was driven in the 1962 and 1963 Monte Carlo Rallies, the RAC Rally and many other races and rallies from 1962 to 1965 by Sydney Allard and his son Alan. Sydney was a winner of the “Monte” in 1952, in car of his own make, an Allard “P” Type Saloon. A feat that is never likely to be be repeated. He narrowly beat the well know driver Stirling Moss. This interesting and unique continuation of a classic supercharged Anglia Allardette, has been built by Alan and Lloyd Allard at the Allard works in Gloucester – so you can’t get much closer to the original car than that. The engine is a freshly built 997cc supercharged 105E. 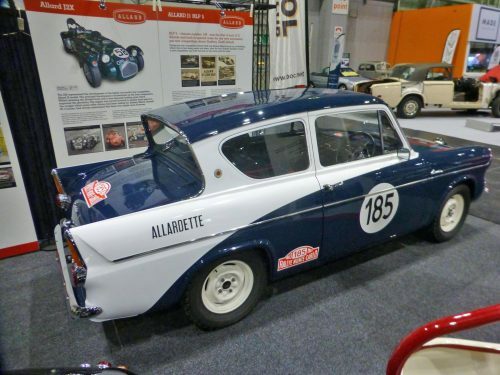 The Allardette Anglia has been extensively restored and rebuilt to the original homologated specification. 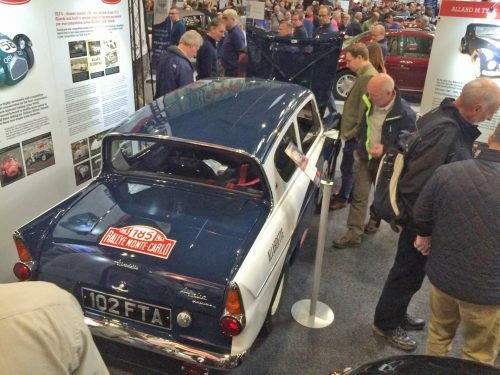 It is suitable for entry into classic International Rallies, such as the Monte Carlo or other competition events. At the same time, it has the driveability to be used as everyday transport. Build noteboook can be viewed here. Now that Allard Sports Cars have completed the Allardette restoration, 102 FTA recently took pride of place on the Allard Owners stand at the NEC Classic Car Show from November 10th – 12th, 2017. Body: The bodywork has been rebuilt from bare metal, acid dipped, primed and painted in the blue and white distinctive two-tone finish just as the original Monte Allardette team cars at the time. Engine: 977cc Shorrock C75B supercharged with 1-3/4" su carburettor; producing a maximum boost pressure of 8.0 psi. Engine power (Est.) 78 bhp at 6,000 rpm. Four branch exhaust manifold with stainless steel rally system. Suspension & Brakes: Uprated suspension, with additional anti-roll bar and disc brakes at the front. Lighting: Cibie high performance rally lighting system including head lamps with three traditional style spot lamps, and option extra foor mounted lamp. Trim: Period sports steering wheel and gauges. Rally seats, with full in date harnesses.